Rohit Sharma was critically acclaimed for his on-field captaincy in the IPL that helped him to become the first captain to win three titles. The talks of his captaincy ability went as far as replacing Virat Kohli as the Indian skipper in the T20 format. However, his recent success with the bat raises doubts about his primary role as a batsman. There was a time when Rohit used to have slightly better numbers in the IPL compared to that of the Internationals. 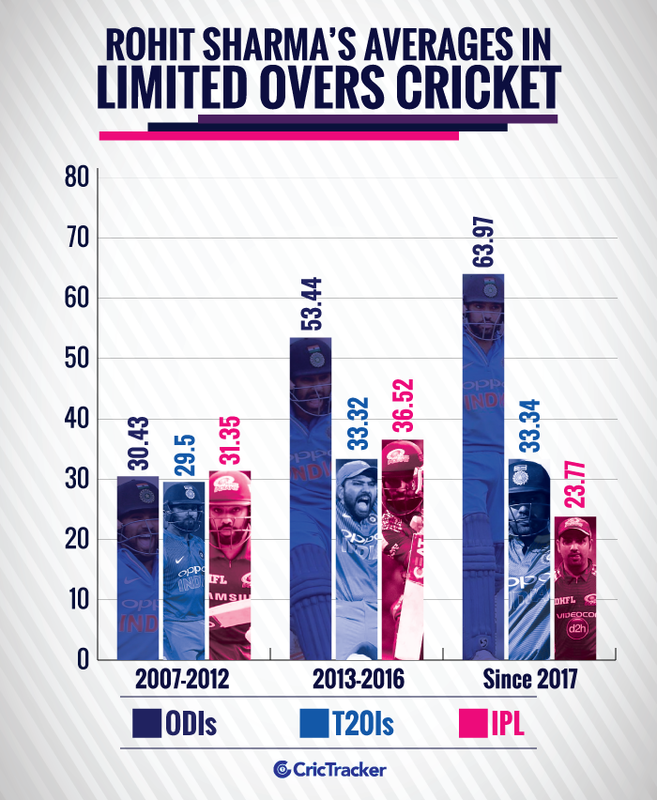 But over the last couple of years, he has been twice the player for India in the white-ball cricket than for the Mumbai Indians in the IPL. Rohit averaged 31.35 until 2012 in the IPL when he averaged only 30.43 and 29.5 in ODIs and T20Is respectively. The year 2013 turned out to be a career changing one for him when he was promoted to the opening slot for India and was handed over the captaincy responsibilities for MI in the IPL. While Rohit got used to the role of the opener for 10 months in a year, the 2-month period didn’t fetch great results when he batted down the order. In his first four years as MI captain, Rohit averaged 36.52 where he slowly got used to batting up the order in MI colours as well. Rohit was pushed as an opener in 2016 where he scored 489 runs across 14 innings; the 2nd most runs in an IPL season for him. He averaged 44.45 and scored five fifties in that season which were his best. Rohit Sharma spent away from cricket for close to six months ahead of the 2017 IPL due to an injury. He kept batting at No.4 as the team wanted to have his experience in finishing. 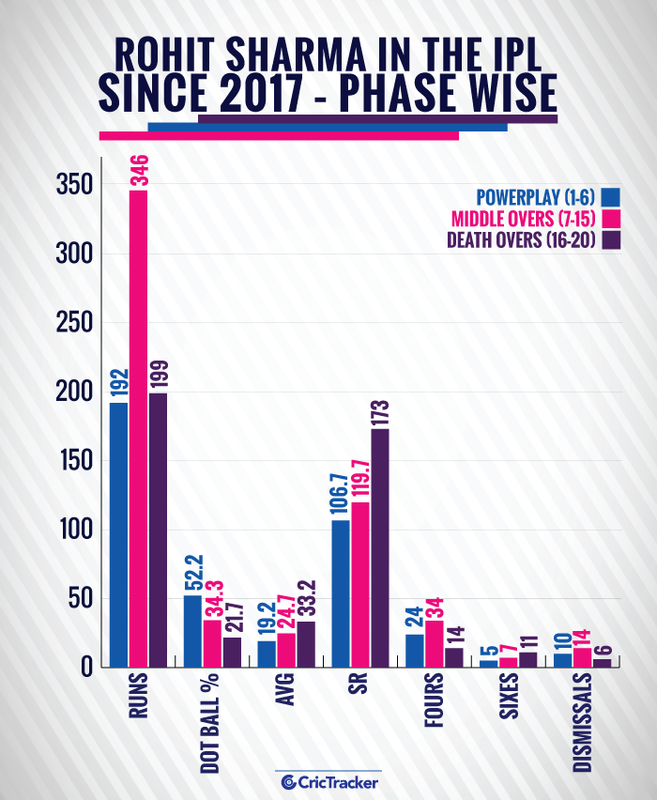 The move allowed young Nitish Rana to bat at No.3 while Rohit finished with 333 runs; his lowest aggregate in an IPL season. One of the main reasons for his failures with the bat in 2017 was his struggles against the spinners. Coming from an injury to his thigh also seems to have tweaked his style of playing the spin bowlers. The Mumbaikar repeatedly fell prey to the leg-spinners in that season as his first five dismissals were against spinners including four to the leggies. In the 2018 season, Rohit repeated the same mistake of settling himself to a No.4 or a lower position batsman. The season turned out to be even worse for him as he ended up with only 286 runs. In 14 innings, Rohit managed to cross 20-run mark only on four occasions. He scored 94 against RCB where he walked to bat at No.4 after his team lost two wickets on the first two balls; a scenario which was no less of an opening batsman. He had scores of 56* and 24* while chasing and scored a 36 while batting first. On all the three instances, Rohit was made a spectator while the damage was done by the batsmen at the other end. 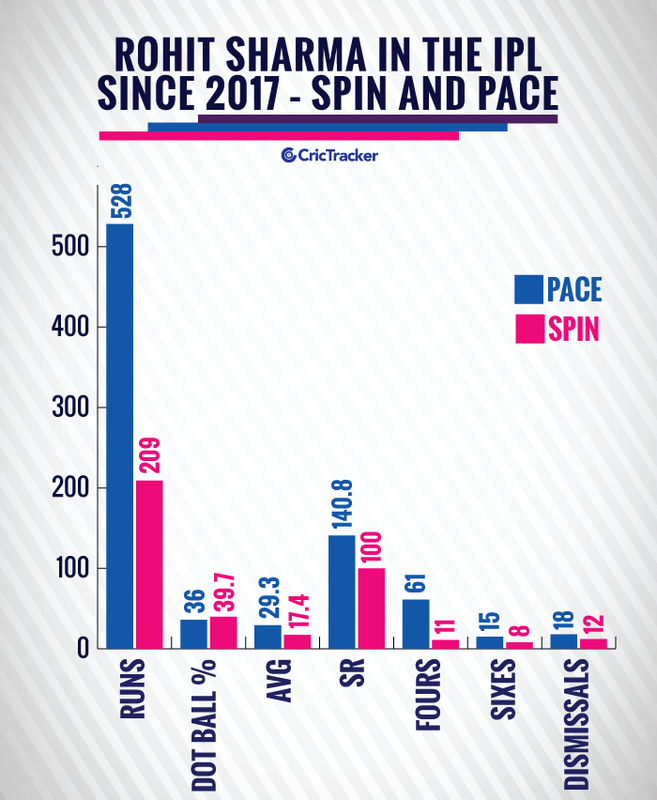 To excel in the middle-overs, players needed to dominate the spinners in which Rohit utterly failed in the past three seasons. His average of 29.3 and S/R of 140 against the pacers look decent in the last three seasons but 17.4 average and 100 S/R against spin is the issue. 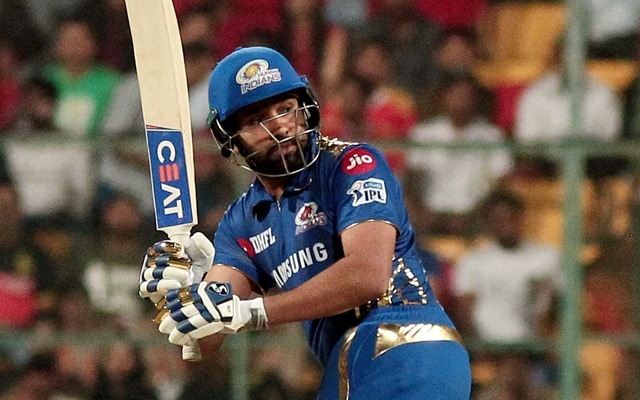 Keeping the CWC in the mind, MI has decided to allow Rohit open in the all games this season. This move is a perfect one given the firepower MI have down the order. However, the fortunes haven’t changed yet for him as he scored only 118 runs from five innings thus far. His 48 and 32 against RCB and KXIP showed glimpses of his form but hasn’t been able to convert the starts. 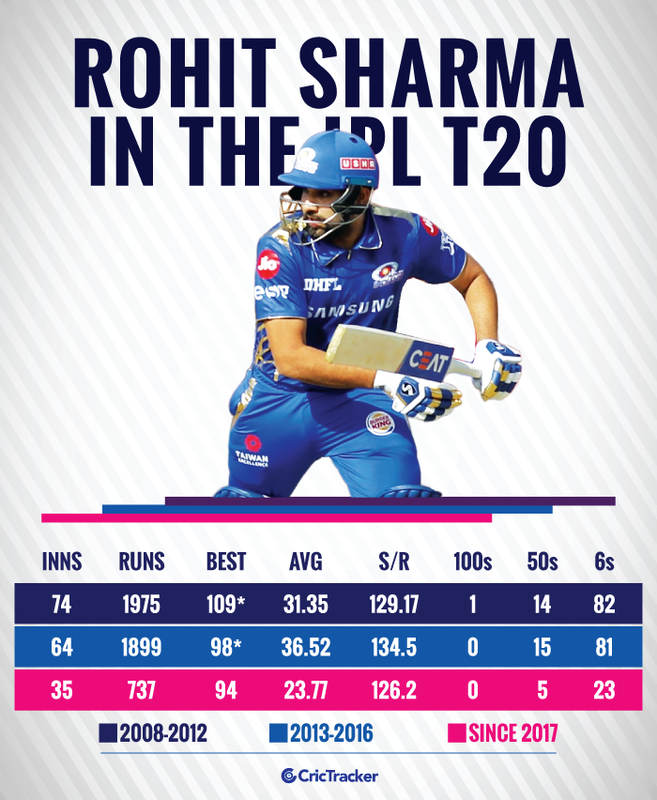 Given the pattern of his scores in T20Is as an opener, Rohit is not far from a big knock and a possibility of his 2nd IPL cannot be ruled out.